This story is for Adam, whose heart is as big as the Ocean, the Orcas and all the sea creatures that he loves so much. 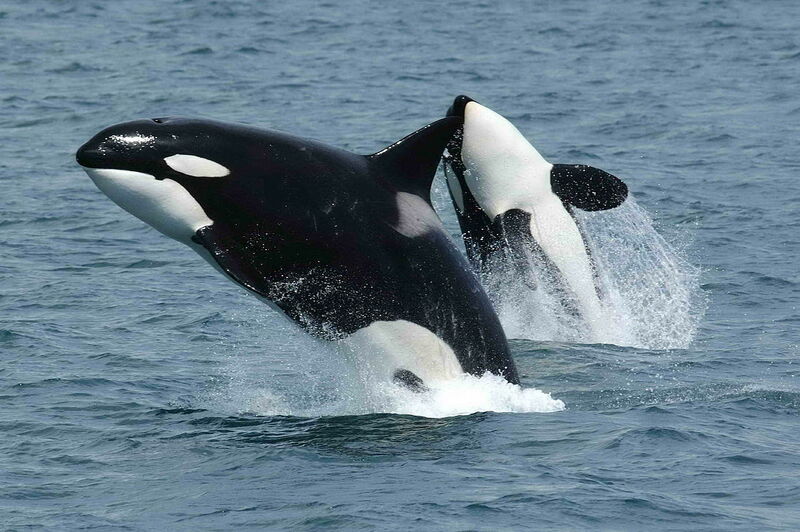 Killer Whales or Orcas are the largest Dolphins. This beautiful mammal is an intelligent, fun-loving, playful, family oriented and devoted Sea Creature or Cetacean. And for the first time in years, this week a new baby has been born to a group whose terrifyingly low numbers, leave many to believe that they are not long for this Earth. The new baby, who is a member of the L Pod, was born in the waters of San Juan off the Washington State Coast, known as Puget Sound. This new calf is a member of Southern Resident Killer Whale population whose numbers are currently at about 79, with two having been listed as missing. The Killer Whales in this area are members of the J, K, or L Pods. The new baby or calf, is number L 120 and its birth is cause for sheer delight, extreme joy, laced with a more than just a bit of trepidation, as newborns in this area and of this particular species, do not have a good track record for longevity. Many of them die in their first year of life. There are multiple reasons for the tremendous decline in Killer Whales here: the Exxon oil spill, and the lingering deadly aftermath of it, as well as the now near extinction of their favorite food, salmon, which has sent them as far away as California to eat. oil spills, over fishing, military and tourist conflicts, greedy marine facilities who take them prisoners to perform. We love to adore them in captivity, watch them on film, and take boat trips out to see them in the wild. Yet we completely fail to comprehend that what we are doing, is killing the Killer Whales. We are simply, ignorantly, loving and crowding them to death. But on this day, far away, in Washington State, there is reason for Puget Pride. This entry was posted in California, cetacean, Endangered Animals, Endangered Species, Exxon oil spill, Killer Whales, Mammals, Orca, Pacific Ocean, Pods, Puget Sound, salmon, San Juan, Southern Resident Killer Whale, Uncategorized, Washington State, Whales, Wild Animal and tagged Animal Abuse, Animal Issues, Calf, California, cetacean, Endangered Species, Exxon oil spill, Killer Whales, Mammals, Newborn, Orca, Pacific Ocean, Pods, Puget Sound, Salmon, San Juan, Southern Resident Killer Whale, Washington state, Whales. Bookmark the permalink. This is a very interesting and informative article. Orcas seriously need our help,to NOT be kept in captivity where they die young. But should be swimming free,as nature designed and intends for them. Thanks for the dedication dear Donna 🙂 Yet another fine piece of writing. You are their Hero Adam and they are counting on you to be vigilant on their behalf. I know that you will never let them down. I helped with displaying the Free Corky banner here in San Diego last month. I met Christine Caruso a teacher from the Northwest, who is working to bring back attention to the plight of these beautiful animals in captivity at SeaWorld. Adding it as a link. Thank you!! Orcas are Dolphins (called Killer Whales) thank you Donna for pointing this out. You and Adam are good for the wildlife, far too few of you in the world. Thank you so much for helping to share this story!!!!! Thank you for your beautiful BIG heart Amy. Now pass it on, tell a friend. The more who know, the better it will be for them. Bravo, Donna, for the work that you and Adam give voice to. I lived in Seattle for years. I know and love the Orcas. They are impossible not to love aren’t they? A welcomed and happy tale, Donna. Well told. As one who lived in Port Orchard WA on the Sound across from Seattle and grew to think of orcas as personal friends your blog was one that I very much had to read. It is a sad one but a call to arms. Thank you for writing this blog. They need all of the help they can get if they are to survive. We are their keepers and we need to do a better job. This is wonderful news! I truly hope baby L 120 stays safe. Donna, I can’t remember a time when I haven’t had an affinity for these wonderful creatures. When I was younger I was so mesmerized by them, I would literally scour libraries looking for books and information on dolphins and killer whales. Every book that came out I read. I guess you could say I was a Cetaceaophile. When I lived in the northwest it was a dream to be able to see these delightful creatures. But Alas it never came to be. It’s sad but encouraging to hear a new life has been added to the number of Orcas in and around the Puget sound. The pollution in the sound has been a big problem for the pods there. The blessing comes in the fact that the Johnson Straight pods are in much better health. It will take a lot of work to improve the health of the pods in the northwest, I applaud anyone who dedicates themselves to this end. Thank you so much for sharing your passionate insiders look at these magnificent, albeit critically Endangered creatures. They will need all of us protecting them if they are to survive! it needs all of us to watch over it! Thank you for your wonderful post! We in Washington love this baby and hope she thrives. There is much work to be done. Please, please do come back and update us………..